Please refer to our stock # TA20020 when inquiring. This is a very old Victorian piece - probably from sometime around 1860-1880. It is a belt chatelaine, silver plated, I assume, since there are no marks other than a patent. It is 8 inches long from belt to end of bottle. 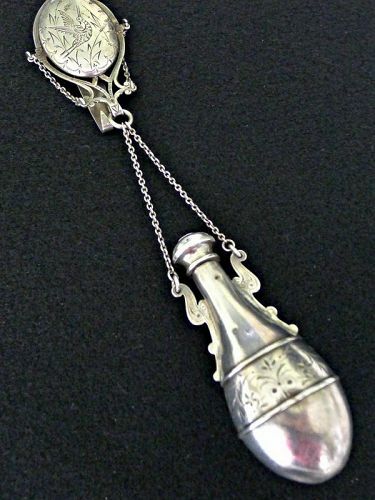 The consensus of opinion among my vintage jewelry friends is that it is a vinaigrette. It appears to be too large to be a perfume bottle. One has to remember that during the Victorian age, there were no room deodorizers, dry cleaners, daily baths, etc., so victorians devised ways to mask the unpleasant smells. This bottle has a cap that unscrews so that a scented cloth or something could be put in it, and then there are holes in the top of the cap, that would allow one to smell a more pleasant odor. It is in good condition for its age with a couple of deep dents in the bottle, and I believe it is silver plated as there are no marks for sterling. The belt clip works well and the top piece is lovely. I believe this to be a real Victorian treasure.